Yesterday's trading session was interesting in that we started with early weakness, experienced a selloff that failed to break last week's lows for most stocks, and then rallied back to the open before breaking out and moving steadily higher. Yesterday's post illustrated how we can track such shifts in strength by identifying the number of stocks making fresh intraday highs vs. lows. If you click on the chart above, you'll see the ES futures plotted against five-minute average values of upticks vs. downticks for every single U.S. stock. This is similar to the NYSE TICK measure that I have written about in the past, but with one important difference: it tracks all stocks, not just those listed on the New York Stock Exchange. For that reason, this U.S. TICK measure is particularly good at capturing the strength and weakness of the broad market moment by moment. (U.S. TICK readings obtained via e-Signal platform). Notice how downticks dominated upticks early in the session, alerting us to early weakness despite the fact that the market was up from Friday's open. We sold off hard in the morning and then, from late morning forward, something interesting happened: upticks on the day began to outnumber downticks. We can see this visually by looking at the area of the chart that U.S. TICK spends above and below the zero line or we can create a cumulative line for the U.S. TICK. Either way, what you'll see is that the distribution of U.S. TICK values shifted during the day--in advance of the market's upward break. Buyers began to dominate sellers. Any individual value for the U.S. TICK can be high or low depending on random flows of the moment. When we see an ongoing shift in the distribution of values over time, however, that tells us that the dynamics of the marketplace have altered. There is yet another way to identify shifts in supply/demand in the stock market: When you study the distribution of U.S. TICK values over time, you know the levels that represent 2+ standard deviations in the positive and negative direction. These significant TICK levels tell you when there is a meaningful surge in the participation of buyers or sellers. Note that we saw precisely such a surge during the noon hour, again in advance of the market's price breakout. Following the breakout, we saw additional surge values to the upside, confirming that buyers were in control. Knowing this can help a trader avoid selling a steamroller market. We can follow the stock market through indexes such as the ES futures, but measures such as U.S. TICK show us that it is also a market of stocks. By tracking in real time what every stock is doing, we gain a perspective on market strength and weakness that is not possible simply by following a single index of capitalization-weighted large caps. When is the Stock Market Overbought and Oversold? When Do Overbought Markets Reverse? What is the Best Style for Coaching Yourself? What's Down in a Bull Market? 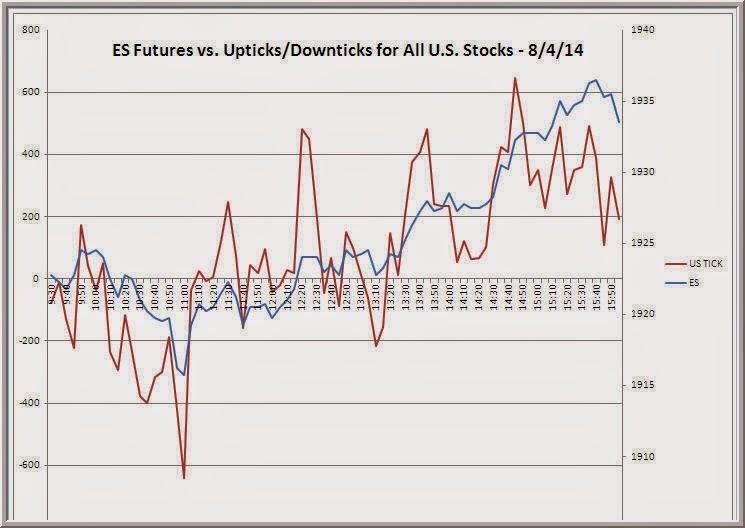 How Oversold Are We in the Stock Market?